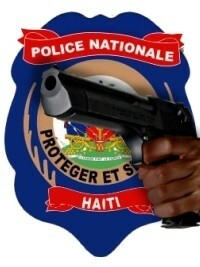 Wednesday 2 police offciers (Agent 1) were victims of a shooting, with to Grands Carreaux, a locality of Villard, (First communal section of Dessalines, Department of Artibonite), while they were preparing to execute an arrest mandate against an actively fleeing prisoner, known as "Ocho". According to Saint-Marc's Commissioner, Marie Dieunane Joseph Borgelin, the two police officers were ambushed and targeted with gunshots and stone throwing as they prepared to carry out their mandate. Police offcier Pierre Ismaël Monvil (26th promotion) was fatally shot and dead in hospital while his colleague Yves Monexil (28th class) was slightly wounded by hand.